Train ticket bookings now available on Google Pay: Google Pay has added a new feature of train ticket booking in India. The IRCTC's support in Google Pay for ticket booking has permitted the users to book, search or cancel a train ticket through the help of the app only. Train ticket bookings now available on Google Pay: The UPI-based payments app Google Pay has added a new feature of train ticket booking in India. The feature is powered by Indian Railway Catering and Tourism Corporation (IRCTC). Google has stated the feature will be available for both Android and iOS users. The feature can be accessed by selecting the trains chat head in the app which is available under the businesses section. The IRCTC’s support in Google Pay for ticket booking has permitted the users to book, search or cancel a train ticket through the help of the app only. The users of Google Pay can also keep a track of seat availability, travel times, and journey duration in the Google Pay app. In order to book tickets from the Google Pay app, users need to have an IRCTC account. Users will not suffer any extra charges for booking tickets through Google Pay. The procedure is similar to other train ticket booking apps like ixigo, Cleartrip and Paytm. 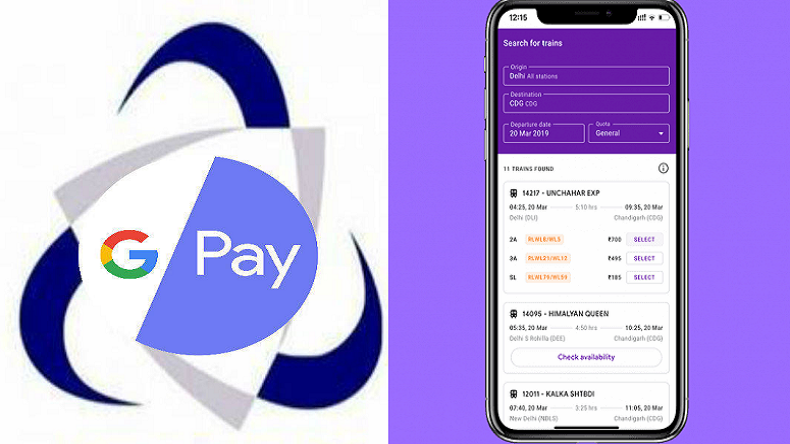 The Director of Product Management, Google Pay, Ambarish Kenghe said that the train ticket booking feature is a one step forward by Google Pay to make their users experience better. Step 1: Open the Google Pay app and click on trains chat head in Businesses section. Step 2: Click on the New ticket option. Step 3: Search for the train by date, origin, destination and travel and the list of trains will be shown. Step 4: Find the appropriate train according to your preference and then click on the Check availability option. Step 5: Select the class of berth you want to travel in. Step 6: Confirm all the information including the station, date, etc, and then you will be asked to enter your IRCTC account details. Step 7: Enter the passenger information, booking information and then select a payment method and click on Proceed to continue option. Step 8: Enter your UPI pin and then you’ll be taken to the official website of IRCTC. Step 10: Enter your IRCTC password and click on the Submit button. Your ticket will get booked and you’ll see a screen with your confirmed ticket.